It’s time to harvest our main crops like sorghum and millet but they still need more water to produce enough grain. I think it might not rain again until next July so I’m worried about food security in my village and the surrounding areas. We rely heavily on farming for our livelihoods but we also keep livestock and we breed cattle. Each family owns between four and ten sheep or goats. Some people may own much more, but breeding cattle is seen as a secondary activity to planting crops here. People are keen on animals though and even though we sell some small animals when we need money it is still hard for a peasant to see one of his animals leaving. But it’s not easy to breed cattle and take care of the farms. There are always conflicts between neighbouring farmers because animals can destroy the fields needed for farming. Almost all the families in the village own cows but they have had to find someone outside of the family to take care of these big animals. 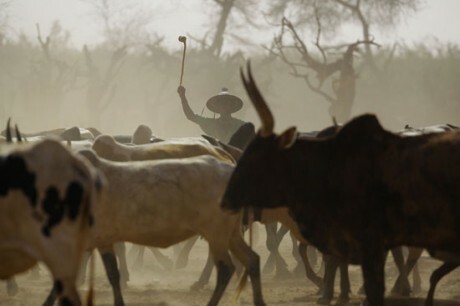 The solution lies in hiring a Fulani as cow-herd. All the cows in my village are gathered in a pen under the custody of a Fulane. The Fulani people don’t grow crops and they are traditionally cattle breeders and they are hired by many Bamabara people who farm. People trust a Fulani cow-herd because he can recognise each family’s cows. The villagers agree verbally with him how much money they will pay for each cow he takes care of. Some Fulani cow-herds we hire ask for cereals as their salary. But because of food shortages, people now prefer to pay them with money. The cow-herd is only hired during the rainy season. His duty is to keep cattle far from our fields. As we are harvesting now the contract with the Fulani who looks after the cows of my village will end soon. The villagers will pay him and he will release the cows. But if someone wants him to look after his cattle he can do that. Anyway it’s not necessary to hire someone to care of cattle in the dry season. Farmers don’t breed many cattle here, but they rely on the animals to improve the farms’ yield. We eat their meat but that’s not the only reason we like them. All the farmers in my village use the bulls to plough their fields. We also use cattle’s excrements as fertilizer. Another domestic animal necessary to our daily work is the donkey. During water shortage time women mainly use donkey to transport clean water from long distances.